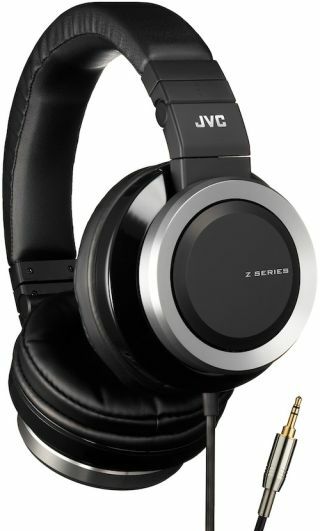 JVC show off Z Series headphones at Bristol Show | What Hi-Fi? JVC has chosen the Bristol Sound and Vision Show 2014 to show off its new Z-Series range of headphones. The range consists of four new models: two in-ears and two over-ears. The HA-FXZ100/200 in-ears comprise an 8.8mm woofer unit, on top of the Twin System Unit. They also use a Kelton-Method woofer structure - an "industry first." In order to implement this technology, JVC has designed a "Stream Duct" system. This system measure 0.4mm in diamater and 30mm in length and has a precision fabricated duct for pure bass reproduction. The Twin System features a carbon nanotubes diaphragm for high frequencies, and a carbon diaphragm for mid tones. These, coupled with the Stream Woofer make up the "Real Sound System" for headphones. This is a combination of the Kelton-Method technology and double bass-reflex architecture. The Stream Woofer DB also allows JVC to incorporate an ideal-sized mid-high frequency driver, mated to a carbon nanotubes diaphragm for mid-high range reproduction, free from bass interference. Stream Woofer DB is a dual bass reflex woofer system that features Dual Stream Ducts and two separate chambers, which claim to provide richer bass and suppress quality instabilities in mid and high range reproduction. Prices for the Z Series are: £160 for the HA-FXZ100; £230 for the HA-FXZ200; £230 for the HA-SZ1000E over-ears and £300 for the HA-SZ2000E.